Discover our collection of male mannequins with heads. Our range includes featureless (also known as egg head mannequins), partial feature and full-featured mannequins. These are available in black, white and skin-tone and come in a gloss or matt finish. 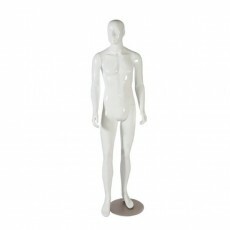 We stock male mannequins found in various stances such as sporting poses making them excellent for displaying a variety of merchandise from sportswear to formal garments.